Well… would you? Let me be quite clear here. This, shockingly, isn’t a hypothetical question. I’m not talking about the very first five batches of a’bunadh; the un-numbered batches produced way back in single malt’s dark ages, the late ‘90s. No, I’m talking about the current batch, the next batch, and the batch after that. £80? Seems a helluva lot of money for an NAS cask strength whisky, particularly when I could get change out of £50 for a bottle of the stuff just last month, don’t you think? Not if you’re one of the bean counters at Pernod Ricard, it appears. 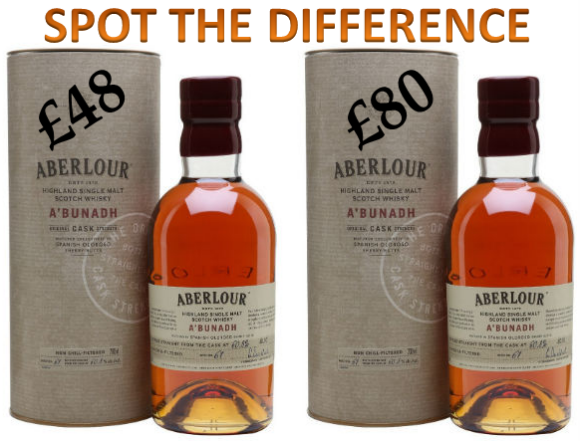 Just a few short weeks ago, you could quite readily pick up a bottle of Aberlour a’bunadh Batch 61 for under £48 if you shopped about (a couple of websites are still stocking a’bunadh at this price, but no doubt once their current stock runs out and they need to order more from PR the price will jump). I’m not quite sure why, but this very same batch now costs as-near-as-makes-no-difference £80. That’s an increase of around 67% compared to a month ago. I can’t think of a single example of another currently-bottled whisky increasing this much, or even close to it, quite literally overnight. So… what’s changed? Does the cork have a self-de-waxing mechanism to ensure you don’t look like an arse when trying to open one with a pen knife? Is the box made of Italian marble decorated with 24ct gold details? Does the liquid now entirely consist of 25 year old whisky bottled at cask strength? No, no and, you guessed it… no. It’s the same old recipe, in the same old bottle, packaged in the same old box. But suddenly it costs over £30 more than it did a month or so ago. Why? Sure, sherry casks are getting more expensive, but I seriously doubt the price of a sherry cask suddenly jumped 67% just like that. It smacks of Dalmorisation, or Mortlachisation… you know, the act of hiking up prices for, well, the sake of hiking up prices. For those of us who are fans of heavily sherried, cask strength whiskies, why should we keep buying a’bunadh when we can buy Glengoyne Cask Strength, Glendronach Cask Strength, Tamdhu Batch Strength or Glenfarclas 105 for a fraction of the price? It remains to be seen how this will affect the cult following of a’bunadh, and, crucially, sales. It seems as though this isn’t just a one off for a’bunadh, the RRP for the rest of the Aberlour range (particularly the 18yo) has also jumped significantly in the past few weeks. As much as I enjoy their whisky, I’m sorry to say Aberlour won’t be getting another sale out of me. Not at those prices. Not now. Thanks, a’bunadh, it’s been a blast, but it’s time for you to go that great big cabinet in the sky filled with equally over-priced Dalmore, Mortlach and Macallan. RIP. This entry was posted	on Monday, May 28th, 2018 at 12:13 pm	and is filed under Musings. You can follow any responses to this entry through the RSS 2.0 feed. You can leave a response, or trackback from your own site. It is (understatement alert) annoying to be sure. It’ll probably affect sales, or at least, it should affect sales. However, the drop in volume will most likely be offset by the ginormous price increase, and then some. While I hope this type of business strategy isn’t rewarded, I’m pretty sure it will work out for Pernod Ricard in the end. I agree – although sales may fall, I think the over revenue will be maintained, or may even increase, due to the huge relative increase in price. In the long term, I wonder how damaging this will be for the brand? You only have to look at the silence surrounding the Mortlach official range now to see that the general whisky consumer is wise and will shift to better value, similar quality, heavily-sherried whisky. Tamdhu Batch strengths and Glendronach cask strengths have already surpassed the A’bunadh in deliciousness. Choice is clear to me going forward, and I have about 2 dozen various batches of A’bunadh. Sadly, no more. I agree the Tamdhu Batch Strengths and Glendronach Cask Strengths are equally delicious, if not more so, than a’bunadh, and I can see myself drinking more of those whiskies in the future when I fancy a cask strength sherry bomb. Enjoy those a’bunadhs you have – I wish I’d stocked up on various batches over the last few years! this is very annoying. and I hereby call all Aberlour fans, not to buy any of that liquid at this price. Has the distributor given any indication as to the reason for the increase? Perhaps we should ask them? Gal & Bwm, thanks for your comments. Gal – yeah, I won’t be buying it any more and imagine a lot of people who enjoyed it will no longer purchase it. Bwm – I’ve emailed Pernod Ricard UK for comment and will let you know if they get back to me. The quality of A’Bunadh declined massively over the years so it is doubly galling that the price is rising in this way. Later batches were harsher and even sulphured in at least one case – I stopped buying after that, even when it was discounted. I’m sure it is no coincidence that the new Casg Annamh Batch 1 has been released at a very similar price level to the one which we were used to paying for A’Bunadh. Whether it is good value is still to be determined but there is a case to be made for the proposition that the single malt market has been effectively hollowed out and RRP value is now very much a relative term. Bought loads and loads of this stuff since October,so glad i did. Still available at Ocado 4 50 quid. Snap it up quick and stand your ground untill they reduce the price. And stop telling them how cheap it is!! Went in to Amazon UK to order a bottle for a friend and was absolutely shocked. I would no longer purchase it for myself. It just isn’t worth it. Thanks to this website for the tip on Tamdhu which I have never tried. I will definitely be switching! Thanks for your comment – let me know what you think of Tamdhu! I’m not even that keen on Abunadh, a bit heavy and lacking finesse, just about worth 50 quid but no more. I’ve got a few old bottles which I bought back in the day because it was clearly collectible. Looks like I will get a good return on the investment but I won’t be buying anymore. Whisky is looking more and more like a pyramid scheme question is when will the money and patience finally run out for the latest overpriced bottles and sending the whole thing crashing to the ground? You can still get Batch 60 for 50 Euros at whiskyzone.de a great online German whisky retailer, I’ve ordered 6 bottles and they deliver to the UK. They will deliver to UK and postage is 20 Euros and VAT is added at the checkout. Thanks for your comments – that sounds like a great find and well worth buying a case at that price! I saw a picture of a’bunadh on the shelves at Inverness airport… £114. Absolute nonsense. I’m just finishing a bottle that cost me £35 ! I will not be replacing it. Thanks for your comment. That must’ve been one of the older batches to have only cost you that amount! Give one of the alternatives I mentioned in my article a shot – each of those should press your cask-strength-sherry-monster buttons! Great tip on whiskyzone.de, but unfortunately they no longer seem to ship to the UK. Sickening, this price increase, after 15 long years of enjoying it. Will look at some of the other sherry casks. My hard-earned cash will no longer be lining the pockets of PR. Thanks for your comment – I’ve just had a look at the whiskyzone.de website too and it looks to me like they don’t ship outside Germany which is irritating. Need to keep looking! This is not the only whisky that is now over priced and I refuse to pay it. It’s about time they were stopped! Contact Whisky Zone admin by email and they will set-up an account for you. They did for me at least. Thanks for the info – James, please see above! Thanks Chris, and Truthspoon. Just found that Amazon is selling it for £60 tonight. I’ve picked up a couple of bottles. Still too much but I was paying £50 now and then before. I can stomach the extra £10, if it means I can have a dram or six on Christmas evening!! Amazon is a quality tip. They’re still doing them for 60 quid but I suppose it’s pot-luck with the batch number. Funnily enough I clicked on the link and Amazon reminded me that I’d bought one from them two and a half years ago. Guess how much I paid. £36.60. Whisky is a SERIOUSLY good investment.